Last Thursday, like most everyone in the U.S., we celebrated Thanksgiving. Rob and I hosted. Our gathering was small and perfect, just the parents and brother and Grandma Betty. 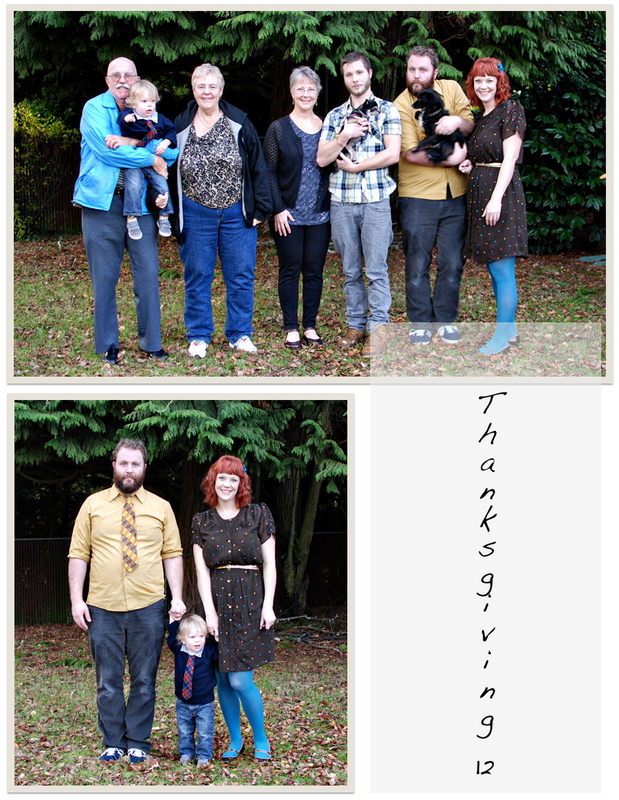 We were surrounded by the things we are most thankful for; delicious food, a roof over our heads, and our family. The day was spent cooking with my mom, who came over extra early to help me, and it was so nice to spend the day together and to have her there to deal with the turkey. While turkey is delicious and a Thanksgiving staple, I just can’t bring myself to handle the raw meat. GAG. Literally, I did. So thanks for doing that, mom! I made an applesauce spice cake and it was overcooked on the outside and undercooked on the inside. I haven’t quite perfected baking in this oven, it cooks too hot obviously. Grrrrrr. Thankfully the weather was perfect so we were able to take a nice family shot (minus Grandma Betty because she HATES having her picture taken). Also, like most Americans, I enjoy watching the Macy’s Thanksgiving Day Parade followed by the Dog Show. 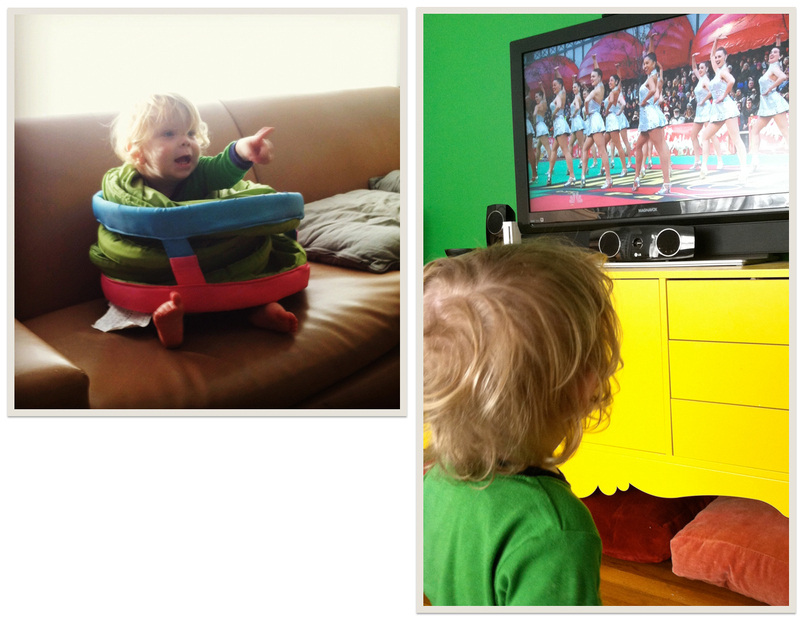 And this year Max was able to enjoy both for a small period of time. One day when we have the financial means to do so, we’ll spend Thanksgiving in New York and go to the parade and ice skating in Rockafeller Center and all the other New York-y holiday things. ONE DAY. 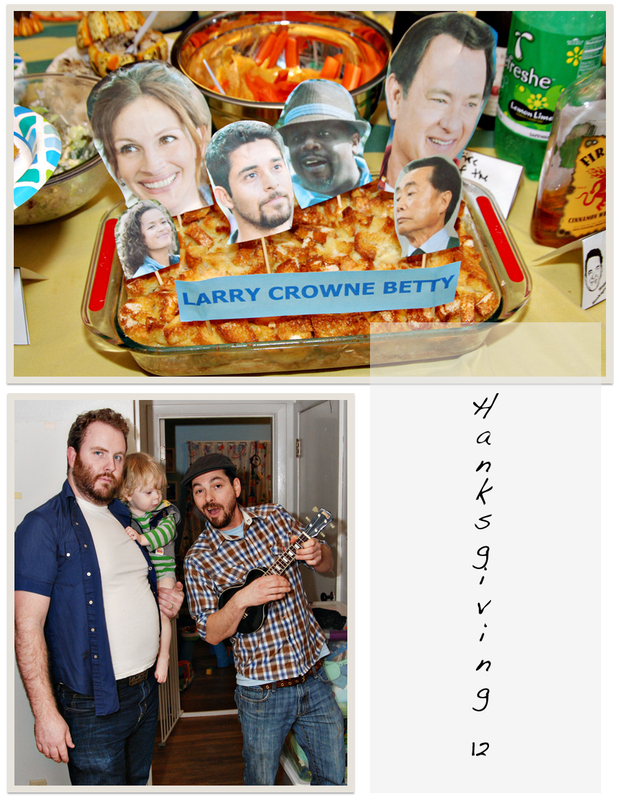 The following Sunday we held our annual Hanksgiving pot luck dinner. 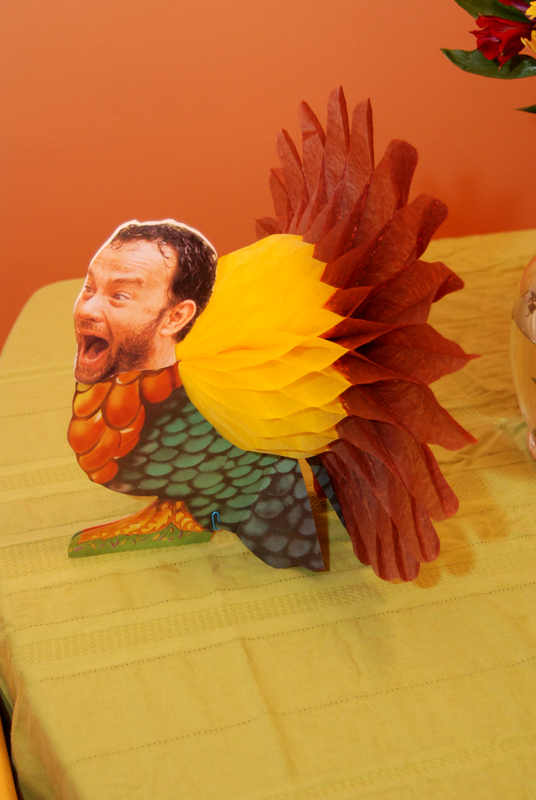 In case you’re new, Hanksgiving started years ago when our Monday Movie Night group started watching Tom Hanks movies during the month of November and call it Hanksgiving. It then turned into a competition of who can create the most ridiculous Tom Hanks food related pun. And so for the last three years we’ve held a dinner celebrating Tom Hanks and bad puns. Have you ever seen Larry Crowne? Not great, but Tom Hanks is still charming. This Larry Crowne Betty was absolutely delightful with a bread pudding top. Made by Tori and Brewster. 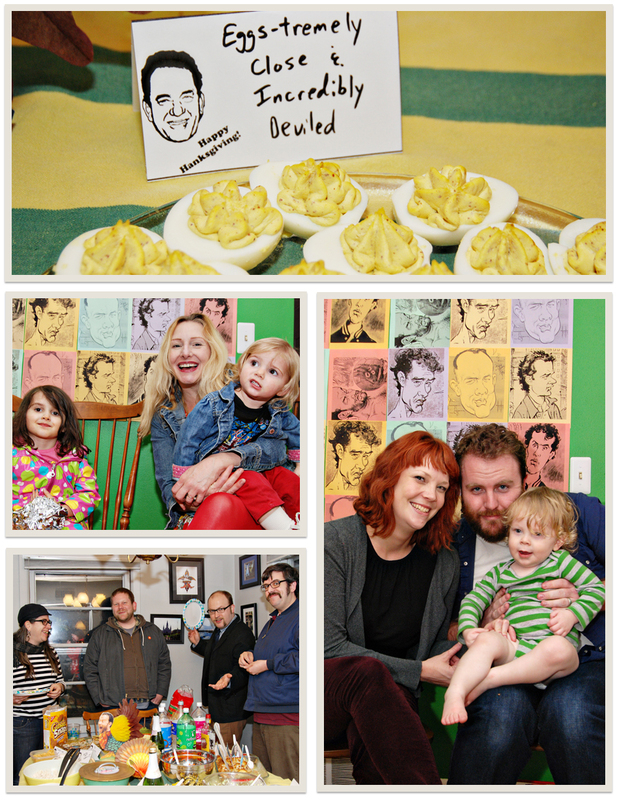 Our friend Greg made a mural of sorts out of pastel colored copies of Mad Magazine caricatures of Tom Hanks and we used it as our photo booth. I made The Man with One Red Beans & Rice, obviously. Mom made Forest Gumbo with leftover Thanksgiving turkey and it was oh so good. 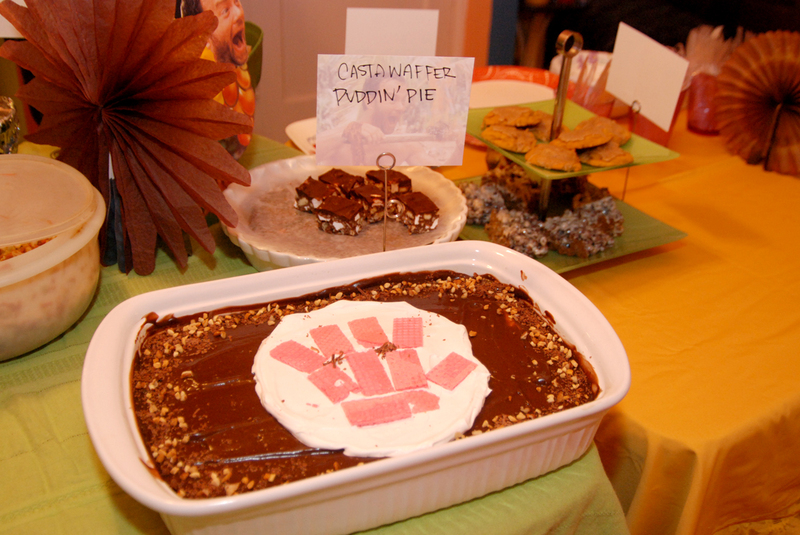 We had a Bonfire of the Vanities dish, Joe vs. the Cupcanoes (cupcakes), Road to Persimmon, and Rob’s Green Bean Mile and it’s handcrafted electric chair were a big hit. It was a fabulously delicious weekend and I’m so thankful that we are surrounded by such great friends and family. See you next year (T)Hanksgiving! 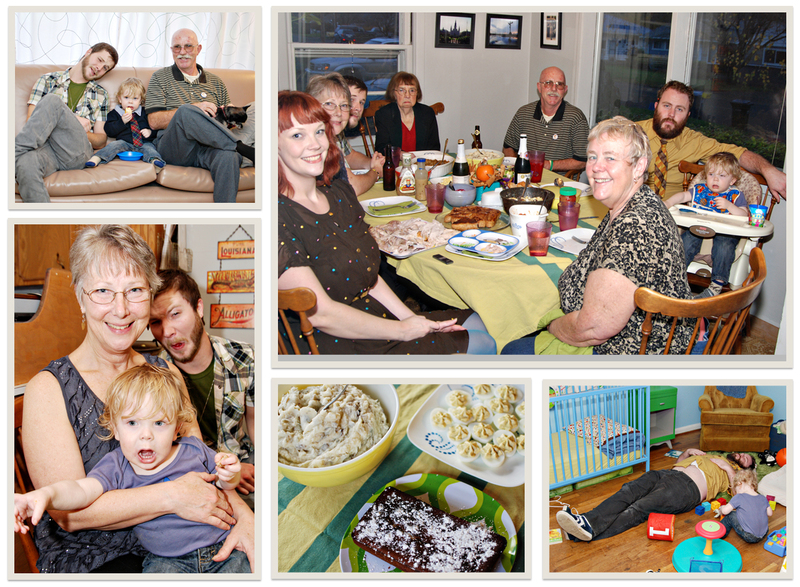 Find past Thanksgivings here: 2011, 2010. I realize pretty much everything I write about these days is pregnancy and baby related. It’s just that that’s all I really have going on right now, which is fine. But I do realize that not everyone cares about how awesome my midwife is. So, to help get back into a non-pregnancy state of mind there is some non-pregnancy related blogging at the end of this post. Enjoy! 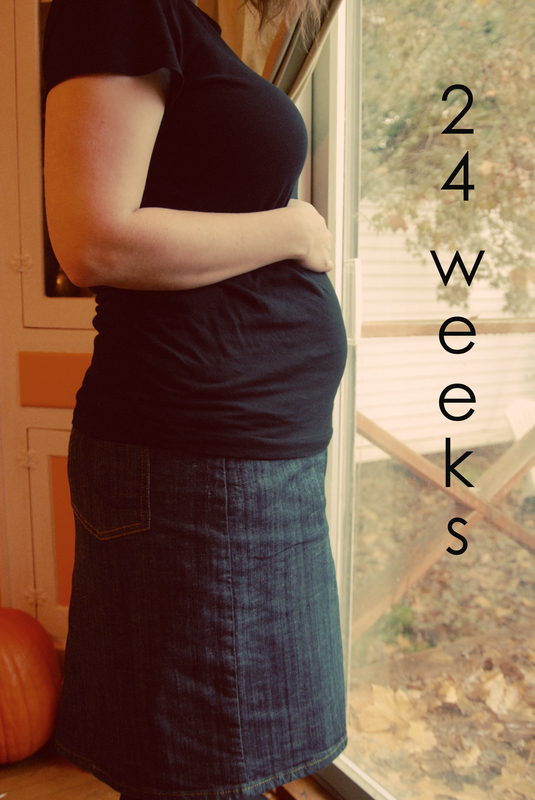 Had my 24 week checkup with the midwife today and all is looking fabulous. Last time she told me I had an anterior placenta (the placenta’s in the front acting as a pillow between the baby and the outside world instead of in the back behind the amniotic sac) and that I may not feel a whole lot of movement on the outside immediately because of that. Well, I informed her that our little monster was causing quite a ruckus in my belly and we can see his crazy moves from the outside, which is really cool. She said we should sign him up for the Talented And Gifted program because he’s already an over achiever. My kid is awesome already. I learned that I’m measuring at 24.5 weeks, which is great. I also learned that at my next appointment I have to take the test for gestational diabetes. This entails drinking a substance called glucola, a super sugary cola drink, in 5 minutes. The an hour later they’ll draw my blood and determine wether or not I get to have further testing for GD. Hooray! Basically, everything is looking great, and the midwife loves us. She thinks we’re super cool, especially after we told her about Hanksgiving (more on that in a minute). I only wish I could guarantee that she’d be the one on duty to deliver the baby. Only 16 more weeks to go! The more I think about how little time is left, the more emotional I get about it. So, I’ll move onto Hanksgiving before I work myself into a hormonal crying fit. For a few years now the movie night crowd has been celebrating Hanksgiving every November. This is the time of year where we watch Tom Hanks movies and reflect on the happiness he has brought to our lives. 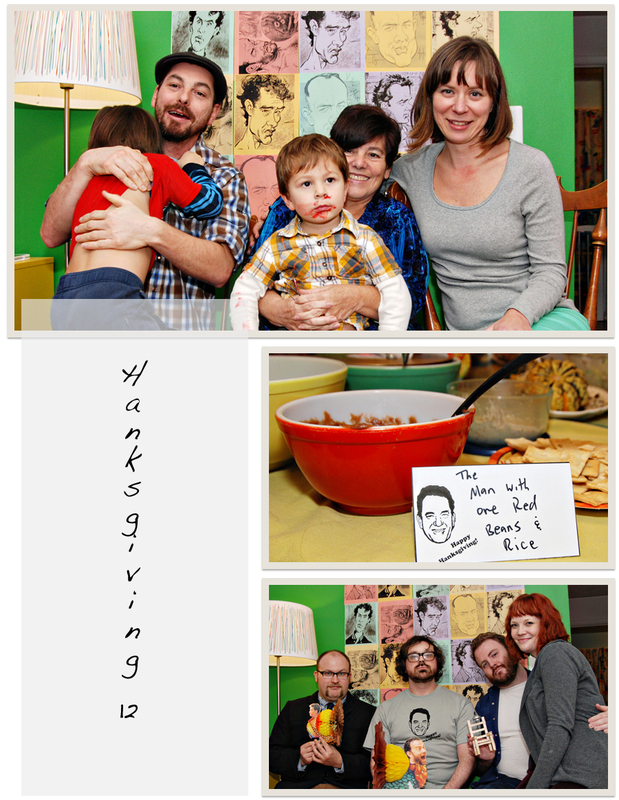 This year we decided to have a Hanksgiving dinner. This meant that our guests would bring a Tom Hanks themed dish and we would share our food and “give Hanks for Tom Hanks”. 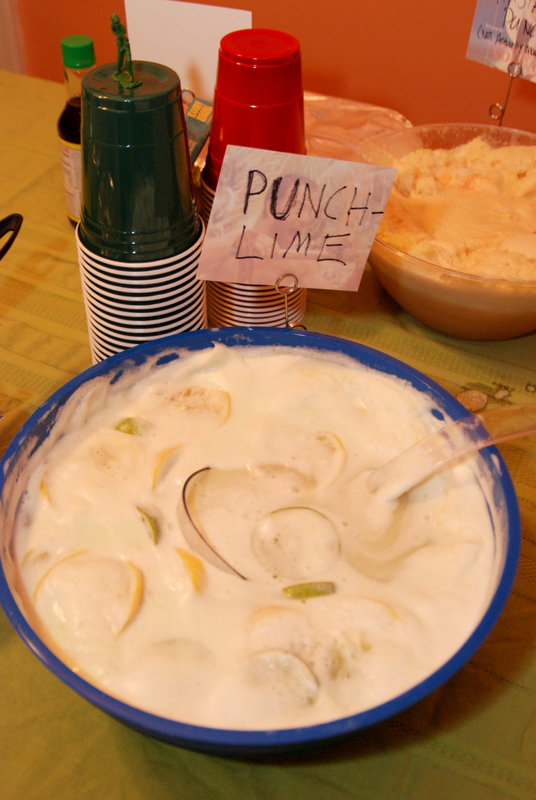 John Meyers brought Punch Lime punch. 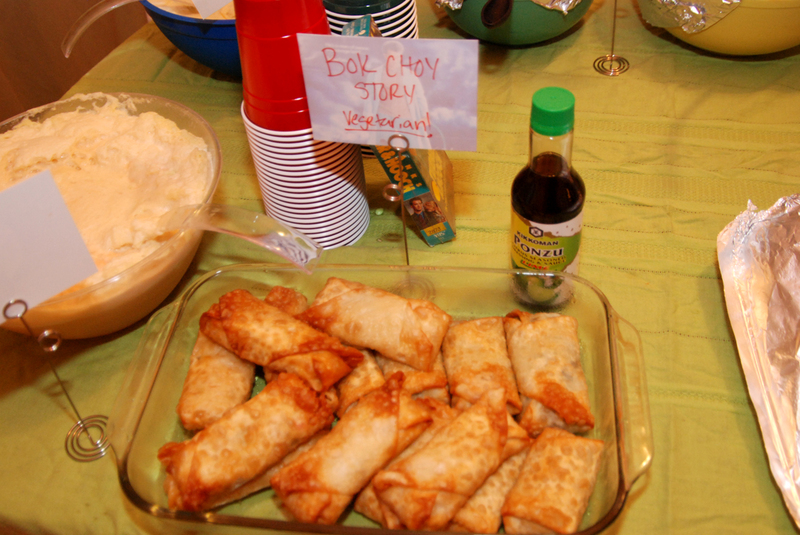 Mike Baden made Bok Choy Story. I was super proud of Katie for becoming a domestic goddess and making the incredibly delicious Castawaffer Pudding. 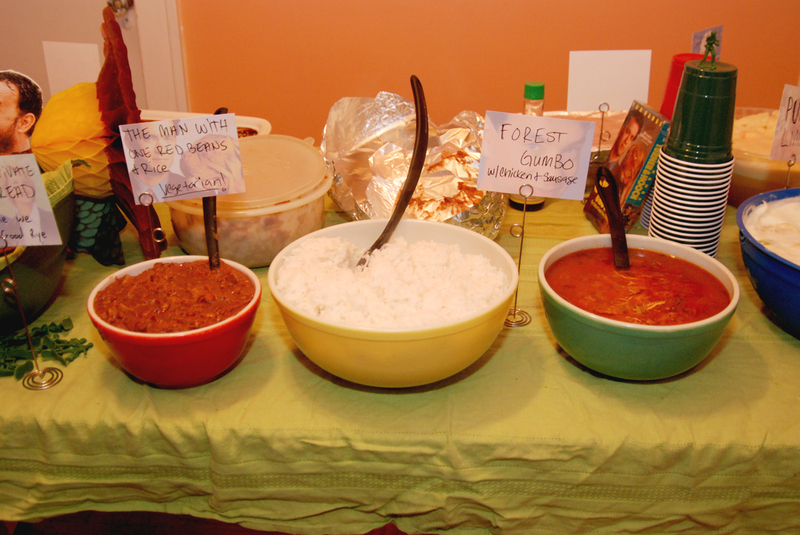 I made The Man With One Red Beans and Rice and Forest Gumbo. 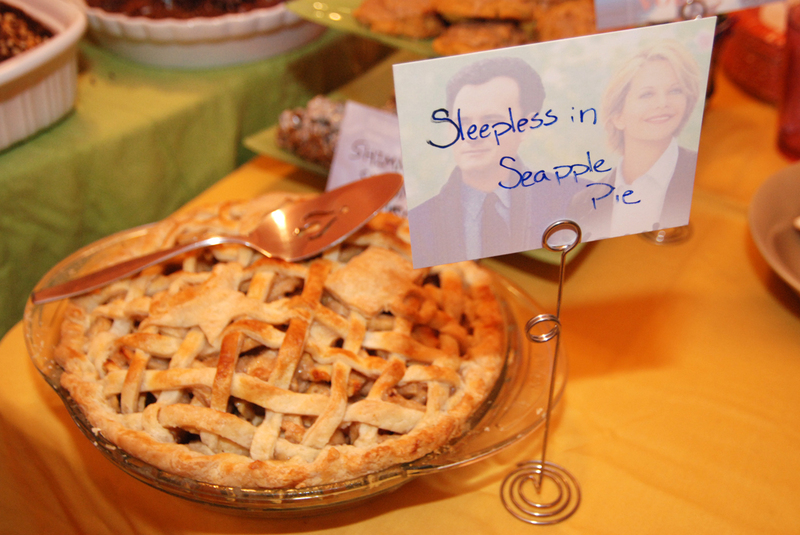 Kate brought Sleepless in Seapple Pie, complete with a Space Needle and coffee cup baked right on top! There were sooooo many more dishes, and unfortunately I failed to photograph every single one. Here’s a list of a few more dish highlights: Devo’s Shimmy, Shimmy Cocoa Puffs, Mike’s Rocky Road to Perdition, Tony & Jenny’s Apollo 13 Layer Dip, Kate’s Joe Vs. The Potato dish, Rob’s The Green Bean Mile, Saving Private Rye Bread, Matzo’s and Monsters, and Catch Me If You Cranberry. I’m sure I’m forgetting many, and if I am please remind me what they were. It was a great night filled with amazing food and friends. I pretty sure this is going to become an annual tradition.